Ananya Vinaya, 12, missed last year’s Spelling Bee final round when she misspelt a relatively easy word, “multivalent” but this year she was able to hone up her skills and never looked back until she broke the final tie with Rohan Rajeev. A sixth-grade student from Fresno, California, Ananya won the 90th Scripps National Spelling Bee by spelling “marocain,” (French word for a dress fabric). She is the 13th consecutive Indian-American to win the spelling bee contest. With her, 18 Indian origin kids have won the contest out of 22 since 1999. The first to win was Nupur Lala. Ananya showed composure when she asked for clarification whether the word is “Part of speech” or its “Language of origin” but most of the time she just went ahead with her answers in a crisp and clear way. Soon after winning the 90th Spelling Bee contest, Ananya said, “”If you try your best, you’re a winner.” The California sixth grader was upbeat when she said:”It’s like a dream come true. I’m so happy right now,” holding her trophy and surrounded by her brother and parents. She will get $40,000 in cash and prizes. It was the first time since 2013 that the bee trophy has gone to a single winner. Ananya said she knew every word she got in the Bee. That’s after finishing quickly last year when she was eliminated on multivalent, and tied for 172nd place in her first appearance at the Bee. “It was kind of intense,” she said of 21 rounds of head-to-head contest with Rohan Rajeev, speller 235 and an Oklahoma eighth grader in his first Bee. She said she has studied a ton since last year’s defeat. 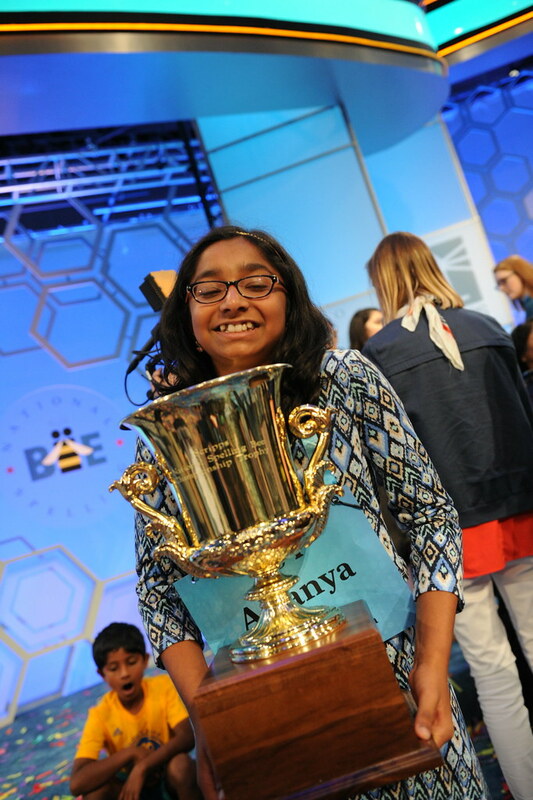 Ananya has honed up her skills at national bee round for Indian-Americans, the North South Foundation and the South Asian Spelling Bee contest but she never won any of those contests before claiming the national bee contest this year. No wonder, Ananya’s favorite word is spizzerinctum, which means ambition to succeed. “It motivates me,” she said.